For larger boxes: 3-1/8" W x 4-7/8" H.
For larger outlet boxes: 3-1/8" W x 4-7/8" H for single gang. Pre-inserted captive screws for faster assembly. Virtually unbreakable nylon. Curved corners blend into any interior. Reinforced ribs for stiffness. 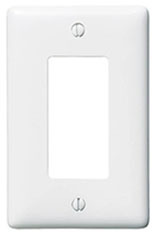 Smooth wall plate for easy cleaning. 4-15/16" W x 4-7/8" H.
For standard plates. 6/32 x 1/2". 100 per box.